Should You Get It Removed? Of course it’s up to you and your personal preferences, but the truth is that it fell out of style a long time ago. If you want your home to look it’s best and brightest, popcorn ceilings will only detract from what would otherwise be a gorgeous modern home. It’s also a huge detriment if you’re looking to sell it eventually, most potential homeowners would move on as soon as they saw these types of ceilings. They’re also susceptible to yellowing over the years, especially if any water damage occurs. Why Does Your Home Have Them? This style of ceiling, also known as stucco, was the popular norm in the 70s and 80s. It was easy to mask any mistakes like dents or nicks in the ceiling due to its rough and bumpy look, so there was no need to ensure perfection with the ceiling. It also added another layer to better soundproof. However, nowadays there are far more good-looking ways to achieve this same function, hence the lack of them in modern homes. 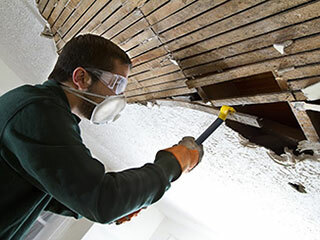 The process of removing popcorn ceilings is a complicated and messy one, which is why it’s important to allow those who know what they’re doing to take care of it all for you. One of the biggest concerns is that of asbestos, which was used to make popcorn ceilings in the 70s. We’ll test your ceilings to see if they’re safe before starting work, and take extra precautions if they test positive so there’s no health risk. Once your furniture and otherwise are all covered for easy clean up, we’ll begin work on removing the texture. If it’s painted it will require more effort with dry scraping, otherwise water will dissolve and remove it. Once the substrate is carefully filled to be flat, it can be primed and painted. Call Drywall Repair & Remodeling Agoura Hills today and let our experts give you a hand before you know it! You’ll be glad you did.